Here’s a project anyone can do and you don’t need plans, just parts. In case you are wondering what a Keezer is, it’s a chest freezer that is modified to hold kegs of beer. The biggest trick is to tame the powerful cooling system in a freezer that gives it it’s name. The easiest way to do that is by using a temperature controller that periodically cuts power to the freezer even when it’s at it’s lowest setting. This effectively allows temperatures above 32 to be maintained regularly, keeping your beer from becoming a Popsicle. It is unlikely that you will want to hoist 1/2 barrels into a Keezer because they weigh a lot! Keezer’s are typically used for 1/4 barrels or Cornelius Kegs (Corny Kegs for short) Corny Kegs are mostly used for dispensing soda but are also popular with home brewers since they hold five gallons of product, the perfect home brewer batch size. They can also be pressurized with CO2. A Keezer is a great solution for those who want several flavors on tap at one time. 1 – New or used chest freezer with top lid. Depending upon how many kegs you want on tap, you can add more towers or a single tower with multiple taps. You can also mount your tap handle on a panel above the swing of the chest freezer. The best configuration is to place the chest freezer behind a utility room wall, then run the beer lines so the taps come out the opposite side of the wall, into the bar room. This keeps the big clunky freezer in the back room and your bar area clear of clutter. See diagram below. 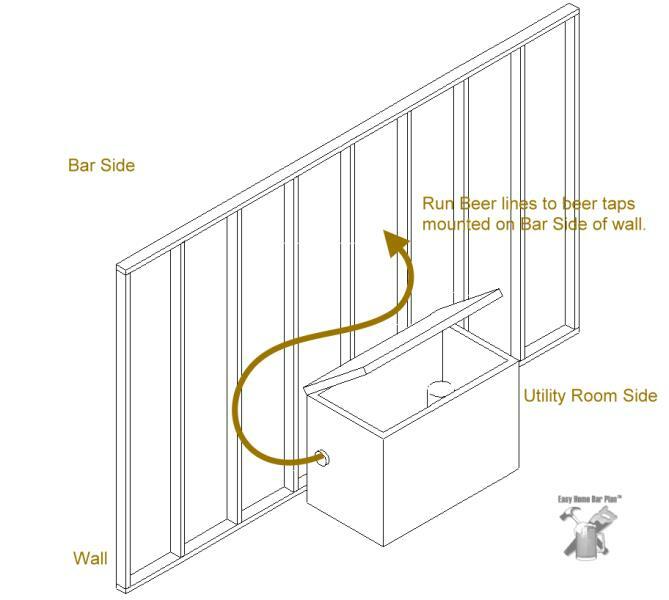 To run your beer line(s) – Cut a 4″ hole in the side of the freezer, then attach 4″ PVC sewer line to allow cold air to flow between the freezer an the taps. Wrap the PVC and any exposed lines with spray foam and foil insulation tape. See our Builder’s Forum for personalized help on your Keezer project. We don’t stock Keezer Conversion parts, but these guys have everything you need, in stock.